TORONTO - The Canadian dollar slipped briefly below parity with its U.S. counterpart on Monday for the first time since January before regaining strength and closing slightly above the greenback. The loonie was ahead 0.40 of a cent to 100.80 cents US after the earlier decline. In pre-market trading it had fallen as low as 99.73 cents US, marking the Canadian dollar's first time below parity since Jan. 31. Investors are nervous about Europe's debt problems and have sought safety in the U.S. dollar, which accounts for much of the currency shift. 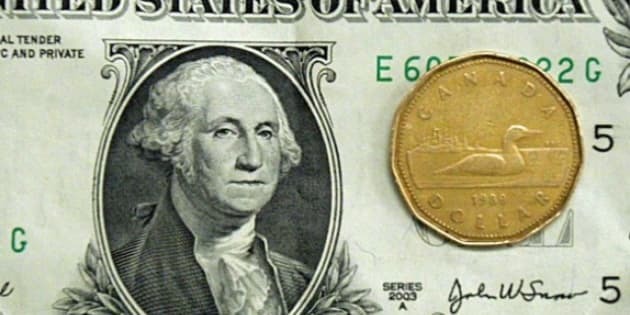 "The Canadian dollar will remain under pressure with global growth concerns and European problems at the forefront of everyone’s minds," said John Curran, senior vice-president at CanadianForex. With a calendar light on Canadian economic data, the loonie is trading based on overall global investor sentiment. Investors appear to be more sensitive to risk as they contemplate whether Greece will have to default on its loans, dragging the eurozone down with it. "Markets are fearful of Greece defaulting and eurozone banks potentially being impacted severely," said Rahim Madhavji of Knightsbridge Foreign Exchange. "The Canadian economy is starting to show clear signs of being impacted by a slowdown in the U.S. What's bad for the U.S. is bad for Canada and it looks like more negative news will come before any good if the pattern continues," he added. Gold, usually also considered a safe haven, fell $46.20 to US$1,813.30 an ounce as investors liquidated their positions in the precious metal. Crude oil prices bounced back from earlier losses to add 95 cents to US$88.19 a barrel. Copper prices fell four cents to US$3.97 a pound. The loonie lost ground on Friday after a surprisingly downbeat employment report showed 5,500 jobs were lost in August. And RBC Economics predicted Monday that Canada's economic growth will slow to 2.4 per cent this year, marking a 0.8 percentage point downgrade from its June forecast. The bank reduced its forecast for the Canadian economy after a "mild contraction" in the second quarter and softer growth in the U.S. and eurozone economies. Currency analysts are divided on whether the loonie will move lower or higher on events in Europe, the U.S. and oil futures. Some see a global slowdown which will impact export demand, and Canadian GDP due to its close ties to the U.S., as well as oil and commodity prices. But others believe the U.S. economy will continue to grow, albeit more softly, eurozone members will find a way to mitigate debt problems and oil prices will remain resilient. "The short term Canadian dollar technicals remain negative targeting parity and the loonie closed at its weakest level this year last week," said Madhavji. "A break through parity could trigger stop losses exacerbating the move to an even higher U.S. dollar."